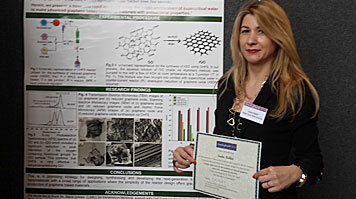 Dr Suela Kellici won the top prize for the poster titled "A single rapid route for the synthesis of reduced graphene oxide with antibacterial activities" at this year's ChemEngDayUK. The conference is designed to bring together researchers, engineers and scientists from around the UK to explore the latest technological advances and research results within the core areas of chemical engineering. Dr Kellici was awarded in the "Materials Innovation for the 21st Century" poster category which consists of an interactive poster session where participants have the opportunity to showcase their research efforts, technologies and share visions with researchers in the UK. The event took place over a two day period earlier this month and was held at the University of Manchester. Dr Suela Kellici explains: "Graphene, a single sheet of hexagonally arrayed carbon atoms, is one of the most promising materials today. Graphene has amazing properties that occur when chunks of graphite are reduced to a single, two-dimensional (2D) layer of carbon atoms (graphene). "However, producing sheets of high quality graphene and graphene based nanomaterials in an economical and environmentally benign way is still challenging. "This collaborative work between the researchers from Green Process Engineering Centre, Dr Suela Kellici and Prof. Basu Saha with molecular biologist Dr John Acord, is focused into rapidly and efficiently making high quality graphene in a more unique and exotic manner by using superheated water with unusual properties. The synthesised material also exhibited superior antibacterial activities. "This clean rapid technology is furthermore explored for making other novel graphene based functional materials in an attempt to create advancements in a number of fields from antibacterial coatings, biological imaging and sensors to next generation catalysts."